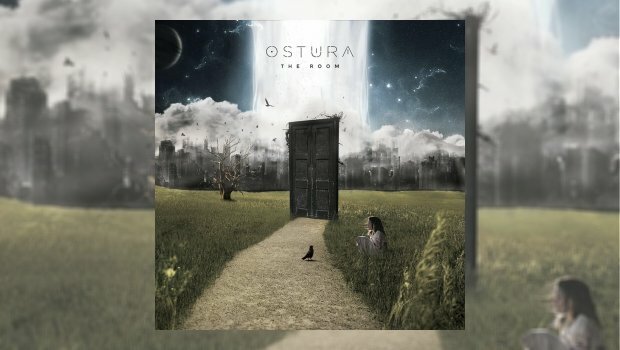 Lebanese progressive metal rockers Ostura has been one of my best discoveries this year and The Room is a fine concept album. This is the band’s sophomore album, their debut, Ashes of the Reborn, having been was well received by critics and audiences alike. ‘Ostura’ is Arabic for ‘legend’, and the band may become legendary after this album. They already know that one of the keys to this lies in working with the best musicians available and they have invited some celebrity guests to perform here, including Arjen Lucassen, legendary drummer Thomas Lang (Paul Gilbert, Peter Gabriel), guitarists Marco Sfogli (James Labrie, Jordan Ruddess) and Ozgur Abbak, Michael Mills on vocals (Toehider, Ayreon) and Dan Veall on bass. To top off the sound the band also invited The City of Prague Philharmonic Orchestra to support the power of the music and they do an incredible job of making The Room a cinematic experience. At its heart The Room is an opera which tells the story of “a social recluse girl who takes refuge in a room. Locked in with her thoughts, fears, and ambitions, the girl’s imagination turns the room into an endless universe where she is the creator”. Most of the recording and production work was completed at the band’s own studio, The Citadel in Dlebta, Lebanon, but the album is a massive production with performances from 12 countries. It is an epic and dynamic album of global proportions. The title track opens the album with the sound of the female protagonist panting and seeming to be running for her life. Guitars and bass build thunder as heavy drums join in the assault and begin the gallop towards full speed metal immersion. The first male vocals are from Elia Monsef’s as he portrays the character ‘Erosion’, sounding very much like many of the guest vocalists Arjen Lucassen has had on his legendary albums. Youmna Jreissati voice enters, sound like an excellent combination of the sophisticated vocals of Marcela Bovio and the sweet, sultriness of Ailyn Gimenez. Strings and keyboards join the chase and build a symphonic amalgam that will immediately draw you into the story. Then, as if it couldn’t get better, Michael Mills enters as ‘Utopia’. I thought it was Marco Glühmann from Sylvan, he sounds so similar here. Escape opens with string orchestration and reminders of the deep bass and violins from The Lord of the Rings soundtrack before the axe chopping guitars bring you back to the story at hand. Youmna’s solo vocal that follows is one of the best on the album; “I start to forget my face, day by day my mind grows weary”, then is turns into an Ayreon trade of male and female vocals, surrounded by guitar solos, drums, and orchestration. It is as if Arjen Lucassen and Dream Theater got together for this song, the guitar solos are terrific and the line “Cross to the other side” is a repeated refrain I remember from many of Arjen’s stories of old. Beyond (The New World) opens with the orchestra supporting heavy guitars, complete with choir. The guitar and bass are magnificent, Mills singing, “Now the story changes, in a world with no frontiers” before Youmna’s solo vocal which is again superb. Let There Be features wonderful running piano, like the glory days of Dream Theater. The Jreissati and Monsef duet that ensues is another album highlight, complete with acoustic guitar and strings, bold orchestration from the City of Prague Philharmonic follows. Erosion begins as a solo vocal from Monsef, complete with strings and dreamlike orchestration. Deep drums and grinding lead guitars feature before the symphonic strings fill the gaps, then the three characters, ‘The Girl’, ‘Erosion’ and ‘Utopia’, trade lyrics and vocals. One of the album’s longest tracks, it’s full of metal instrumental and vocal genius. Only One contains one of Jreissati and Monsef’s best vocal presentations. The quieter strings and light orchestration at the beginning allow you to appreciate the full range of their voices before the band takes over. The vocal emphasis returns, and later they are surrounded by a quiet piano backing, which allows you to truly appreciate Jreissati’s voice. Choirs join in to really take this track over the top. Mourning Light is the break in the pounding metal action I was waiting to hear. Jreissati’s voice supported by soft piano, strings, and quiet orchestration comes as a breather. It would make a great standalone single and is a showcase for Jreissati’s unique and wonderful voice. With a title like Deathless you can imagine what to expect; heavy guitars, bass and drums with ripping strings, dark orchestration, screaming vocals and dread. However, they do it well, and there are some wonderfully calm vocal moments in the middle. The violin solo and bell like keys towards the end are worth the wait. Darker Shade of Black is the best track here, Arjen Lucassen playing a perfect solo with the strings at their best. The track opens with cool, eerie morning light orchestration and guitar, then wonderful keys and flute like dawn on a wide horizon. Acoustic guitar, orchestration, violin and strings provide the balanced sound that proves this band is developed well beyond ear aching metal devastation. At over 9 minutes there is much to enjoy on this epic track. Beautiful piano opens The Surge, along with Turkish guitar flavours. Soft drums and strings surround Monsef’s vocal showcase, choir and orchestra making this one of the best tracks on the album. The electronic sound effects aren’t bad either. Duality is the longest track at over 12 minutes, and it is full of magic. Heavy drums and cool electronics open the song, guitar soloing, flute, and wonderful deep keyboards filling the soundscape. The keyboard solos and strings on this track are worth the price of admission, but there’s plenty of heavy guitar and metal to brighten any fans day. Bells and another of Jreissati’s best vocals appear amidst strings, acoustic guitar returning alongside Monsef’s softer vocals. The story ends with Exit the Room, to chilling soft piano and deep bass strings. Not only is the music on Ostura’s The Room wonderful, but the artwork is worth framing. A powerful and complete concept album… nothing’s missing. They have studied their hero Anthony Arjen Lucassen well. So much to listen to and enjoy, the epic wonder of it all, one hopes that they will be allowed the time to create their next work of art. Like a perfect mix of Dream Theater’s classic best with Ayreon themes, put on your headphones and get lost in the story and the music.